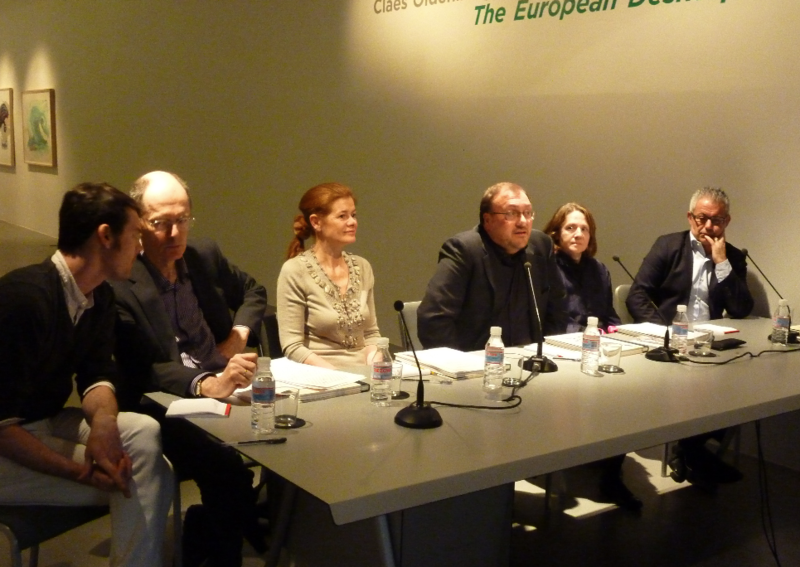 Participants in the roundtable discussion at the presentation included Richard Cork, art critic, writer, and author of the catalogue’s text; João Fernández, director of the Serralves Museum, Porto, Portugal; Bartomeu Marí, director of the MACBA, Barcelona, Spain; Estrella de Diego, professor of Contemporary Art at Universidad Complutense de Madrid, Spain; and Elena Ochoa Foster, founder and CEO of Ivorypress. Other attendees included James Lindon, director of the PaceWildenstein Gallery, New York, USA, which collaborated with Ivorypress in The European Desktop exhibition and the publication of the catalogue. The volume features two articles analysing the work of Claes Oldenburg and Coosje van Bruggen. Richard Cork, who specialises in the work of these two artists, provides an overview of their career and a symbolic reflection on The European Desktop. The edition also contains an in-depth interview by the curator, Ida Gianelli. The catalogue includes photographs by Attilio Maranzano taken at Ivorypress Space, together with sketches and studies of the pieces in the exhibition and images of a selection of key works from Oldenburg and Van Bruggen.